Its Saturday evening and I am standing over my biggest stockpot. The apricots are bubbling, hissing and frothing furiously. The stone fruit is starting to sag and collapse, but no matter how far it reduces there's no doubting that there is going to be a sizable quantity of puree. Loads of apricot jam. Mr Hoppo Bumpo has been surveying the situation from afar. I think I have detected an air of approval. The sort that might come, say, with thinking that making jam at home was saving us money. Come closer. Lean in. I need to ask you something, but its imperative that Mr Hoppo Bumpo doesn't get wind of what we're talking about. Is it just me or is the whole handmade/homegrown thing not always that economical? For example, a cost comparison of a recent batch of homemade sauce resulted in parity with supermarket brands. Hmmpph. All that effort without a saving. But worse, a look around reveals potential losses. The sums show that my meagre tomato crop has worked out at approximately $143.60 per kilogram. And that homemade cards cost about $37.20 each. Let's not even think about the clothes I have been sewing. Its becoming evident that I need to find some kind of easy, well-paid employment to fund my homemade/homegrown drive ... and keep the pretence of making a saving. I'll tell Mr Hoppo Bumpo its money for jam. My dear hubby just hopes that I make enough from my "home made" profession to cover the cost of my crafty purchases. I'd like to say that my new embroidery machine blew that idea out of the water but really, it was never even looking close! (And I also love the fact that while I am spending my exciting Saturday nights washing and cleaning the kitchen, you seem to be sharing my standard of a social life! hehhee, that's what I was contemplating today after an awfully quiet & extremely hot market day, when I was faced with a kitchen to clean. ohhh Liesl, it's all about the love of making! Hee hee.... can you tell him that a 'making' addiction is at least a little bit cheaper than a shopping addiction? As a handmade crafter, i'll skip over the passion, quality, love & detail that we simply don't put a price on our products . . . so onto the food side . . . it's about not using preservatives, knowing each ingredient & being plain healthy. It's all about the quality of the end product. 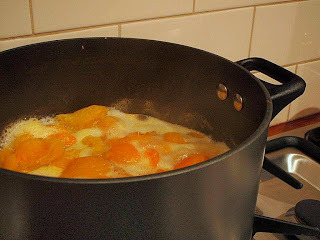 Your homemade apricot jam is going to be soooo much more delicious than the crappy stuff you get at the supermarket. Can't put a price on that. I can almost smell your delicious apricot jam. I think it is better to use creative accounting when working out the cost of your creative endeavours. It is all about the process, right? I think of it as a cheaper hobby than, say, restoring vintage cars or flying aeroplanes..... and when you really think of how much you'd pay for the finest of gourmet preserves, you really are doing ok. (NOTHING beats home-made apricot jam.... you can't buy decent stuff in the supermarket). I'm up to my ears in plum jam here. I agree, home made jam far superior to cheapo supermarket crappe, and worth the effort. I have been telling my son that his home made pj pants are even more comfy because they were made with 'lurve'. But when he put his foot through the crotch I nearly cried. Hopefully, once I repair them, he'll still think they're extremely comfortable. Just don't tell number 2 son how much money I saved getting his from Best and Less. Aah. But at least you know what's in your jam! My husband's catch cry (usually very, very late at night) - "Why don't you just go and buy one?". Expensive, yes, but it's so much more fun than just buying stuff isn't it. Wow - this is a popular post! While I enjoy making and growing things I do agree that it's not necessarily cheaper and it isn't something everyone can afford to do. A lot of people above have mentioned 'knowing what's in your food', my compromise on the whole food issue is to buy at farmers markets. Better than the supermarket, home grown with love, but not money out of my pocket if those tomatoes don't ripen. I bet the apricot jam is fantastic though- my favourite jam is apricot! !